This is the view of the Karak Highway from KL towards Kuantan. The subject property is on the left and is just 300 metres before Sungai Dua new village. This village comprises mainly farmers with their own 6-acres orchard or rubber estate. 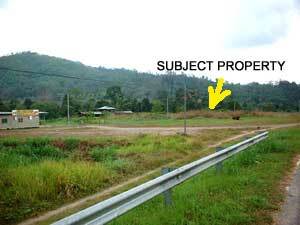 Just after the bend towards the right on this photo a 2.2 acres (approx) land was sold for RM300,000. A closer look. Just before this subject property is a structure used for displaying furniture and it looks like this stretch of flat land may turn into semi commercial land. The electrical pole is clearly visible here. There is a wide road reserve between the Highway and the land.